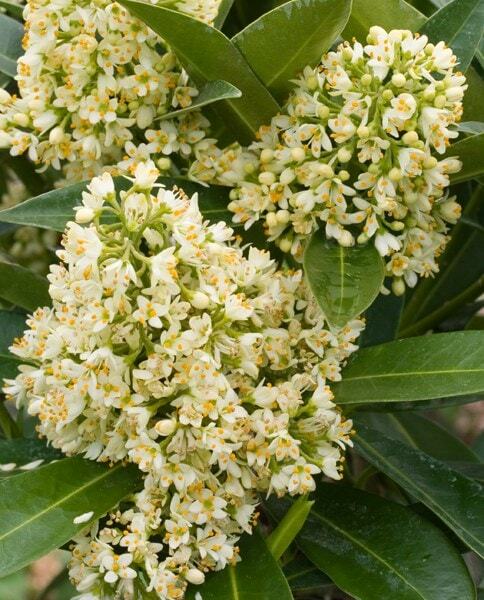 A compact, dome-shaped, or taller evergreen shrub (it can be quite variable), with dense clusters of fragrant, creamy-white flowers, which open over several weeks in late winter and spring. 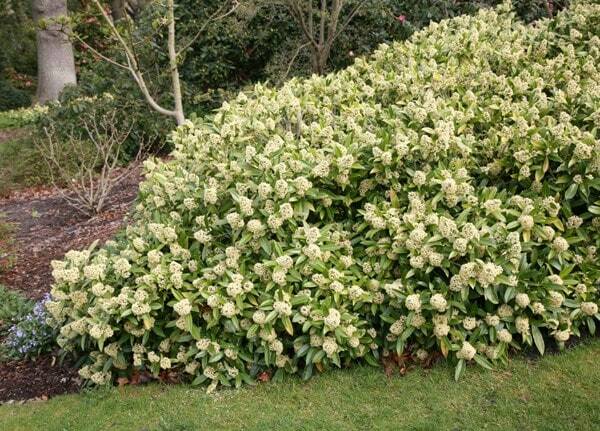 This award-winning shrub is perfect for illuminating a shady shrub border or woodland garden. Requiring little routine pruning, it's useful for 'anchoring' taller, upright plants and pollinating female skimmias planted close by. I wanted attractive easy evergreens for a semi shaded walkway that would thrive in large pots . I like skimmia but am not a fan of bright red berries so this variety with creamy green berries is perfect . Over a year on they are all thriving . My plant must now be six years old. It is at the front of the border, not overly large, about 3ft. It requires little, if no attention. As an evergreen it looks great throughout the year, but come the Spring, 'Wow' the fragrance is lovely and it positively hums with insects. So many people have asked what it is called . . . This came to me already at a good size and has grown a lot since I planted it in my garden. It seems to be happy in its shady spot on heavy clay soil - as the Crocus plant finder said it would be! 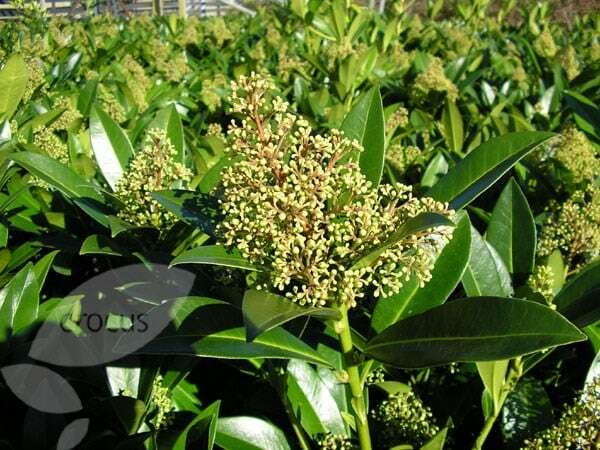 I'm thinking about buying a Skimmia x confusa 'Kew Green' (male) and a Skimmia japonica 'Pabella' (female). How far apart can they be planted and still cross pollinate? Hello there There isn't a hard and fast rule as cross pollination will depend on the wind, birds and bees in the garden, but I would plant them within about 5m of each other. Hope this helps. Does Skimmia x confusa Kew Green require an acid soil to thrive? Hello, These plants do not require acidic conditions and will grow in moderately fertile, moist but well-drained soil.